Donald Trump's north east golf course has "partially destroyed" the specially protected site it was built on. That is the conclusion reached in a draft monitoring report by the government watchdog, Scottish Natural Heritage (SNH). The findings have been released to the BBC under freedom of information, as the president prepares to visit the UK. The assessment dates from 2016 but SNH has delayed a decision on downgrading the site from special status. Donald Trump opened his controversial and widely acclaimed golf course on the Menie estate in Aberdeenshire in 2012. It is partly built on Foveran Links - a Site of Special Scientific Interest (SSSI), originally listed as one of the most exceptional sand dune systems in Britain. In 2008, SNH warned a planning inquiry that the golf course development would seriously damage the SSSI. Planning permission was granted on the basis that the potential economic benefit would outweigh environmental harm. In 2012, SNH advised the Trump Organisation that de-notification of the SSSI was likely. They have been monitoring the impact of the course on the dunes and the habitat they created, with site visits in 2012, 2013 and 2016. Two years ago they concluded that the site's special features had been "partially destroyed" with no prospect of recovery. The draft site condition and monitoring report states that "part of the site has been destroyed or damaged by the construction of the golf course on Menie". "Most of its important geomorphological features have been lost or reduced to fragments," it adds. Image caption Donald Trump's plans for the specially protected site sparked huge controversy. Before the course was built, the dune system moved north at substantial speeds - up to 11 metres (12 yards) per year - across an area of about 15 hectares (37 acres). It was considered one of the finest examples of a mobile sand dune system in the UK. In November 2017, SNH confirmed that it was reviewing the boundary of the Foveran Links SSSI. It said a decision on whether or not to denotify all or part of the site was due by the end of that year. Within days of that being reported by the BBC, SNH sent a full briefing to the Scottish government and held a meeting with the Trump Organisation. It has since decided to consider the future of the Foveran Links site as part of a wider review including other SSSIs. That has delayed a final decision which is now due to be taken by the SNH board later this year. SNH has released a series of documents relating to the environmental status of Trump Aberdeen in response to a freedom of information request. It has withheld documents that make recommendations about the site's future on the basis that publication could prejudice the board's decision. 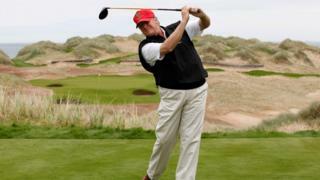 Image caption The Trump Organisation has insisted its environmental approach in Aberdeenshire is "first class"
Ross Johnston, head of operations, said: "We are reviewing a number of SSSI designations across Scotland including the Foveran Links SSSI which overlaps the Menie golf course. "In response to a request for information, we have released the site condition monitoring report that has been prepared as part of the review. "The results of the full review will be published after it has been considered by SNH's board later in the year." The Trump Organisation has previously said that it would be comfortable with whatever decision is reached. It has also insisted that its environmental approach in Aberdeenshire has been "first class".